For decades, residents of East Baltimore have been victims of strategic disinvestment and subsequently disregarded in redevelopment of their neighborhoods. Now, in the midst of East Baltimore Development Incorporation (EBDI) efforts, communities in East Baltimore are rapidly evolving. It is more important than ever to strengthen community voice and celebrate the culture of the neighborhood and its residents. Members of the C.A.R.E. 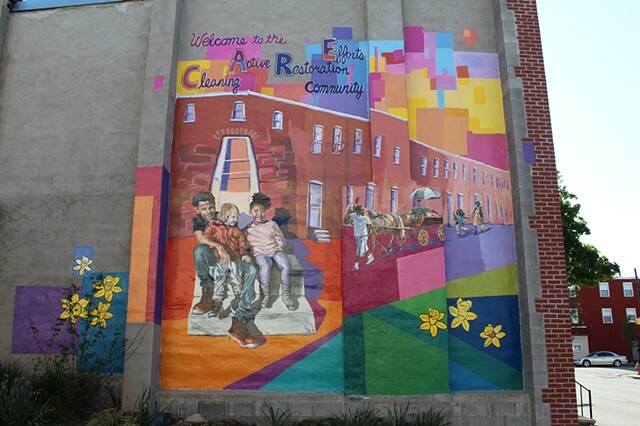 (Cleaning Active Restoration Efforts) Community and I have collaborated to create a vibrant mural adjacent to a pocket garden at Duncan and Orleans Streets. The mural is a statement of the community’s history, positive characteristics, and growth. In the C.A.R.E. community, the cultural landscape is rich and multifaceted. Nostalgia is an Arabber belting out his song over the clip clap of horseshoes. Jackhammers and the thump of construction debris are reminders of strategic disinvestment and misguided redevelopment. Laughter in a new pocket park is the product of a dedicated community association crafting their neighborhood’s future. Conceived, developed, and implemented through collaboration between multi-generational residents and myself, this mural is a new layer in the cultural landscape. Blocks of color emerge from gray architecture, generating an image of rich neighborhood life. The montage of vibrant colors is adorned with eternally blossoming daffodils that community members have dedicated to those that have paved the road before. This layer highlights the beauty within C.A.R.E. and is an endorsement of the community’s capacity to create positive change from within.